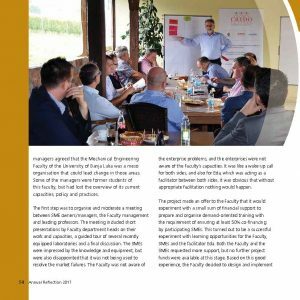 In the new publication Annual Reflection 2017, published by Mesopartner, a renowned international knowledge firm that is specialized in economic development, competitiveness and innovation, on pages 52-55, an article on Eda’s experiences gained during implementation of the CREDO Krajina project was published. 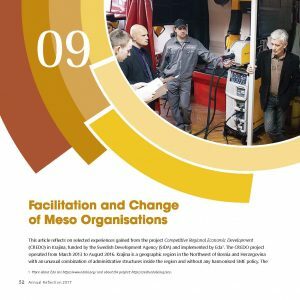 The article emphasizes importance of improving communication and cooperation between enterprises and meso – support institutions (in this case, the Faculty of Mechanical Engineering, University of Banja Luka), as well as the importance of facilitating this process. In this way, mutual understanding and trust among the most important actors in process is enhanced and small but important changes in usual models of behavior are initiated. This way, new experiences were created which enable learning and continuous adjustment. This approach enables achievement of good results, even in complex situations, as evidenced by good results of the implemented CREDO Krajina project. 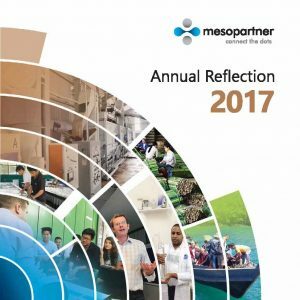 The publication Annual Reflection 2017 can be downloaded here.